Even the most stylish Angelenos can use an extra hand when it comes to style inspiration. If you're a true trendsetter, you're already know the top vintage stores for some killer finds and follow best LA fashion bloggers. Up your fashion game and stay on top of current styles and products with these latest and best apps for your smartphone. Looking for ways to upgrade your spring wardrobe? There's an app for that. Lusting after an outfit you saw on Instagram? This app can help. Keep has a list of more than 100 of Instagram’s most popular fashionable users, as well as other fashionistas and influencers, and helps you find and purchase the items featured in their photos. If you’re not ready to buy one of their picks, Keep will also alert you when items go on sale. NYC is the city with the highest number of Covet Fashion users, and it’s easy to see why we’re obsessed. The addictive app allows you to style women’s looks from brands such as Halston Heritage and Cynthia Rowley, and successful ensembles can result in prizes both real (like giftcards and a Nanette Lepore satchel) and virtual. Covet Fashion is a good way to discover new items while playing with your style—without having to invest any cash. If you prefer boutique shopping over rummaging through the offerings at chain stores, this app is for you. House Account features the newest arrivals from more than 300 of the best boutiques in the country (including Bird and Kirna Zabete here in New York). Browse by trends, designers and store locations to discover hard-to-find, original pieces. The phrase Where’d you get that shirt? could disappear from our lexicon, thanks to ASAP54. The app allows you to take a photo of an article of clothing you see on the street (or anywhere, really) and will help you find it (or something similar) from more than 150 retailers like Topshop and J.Crew. 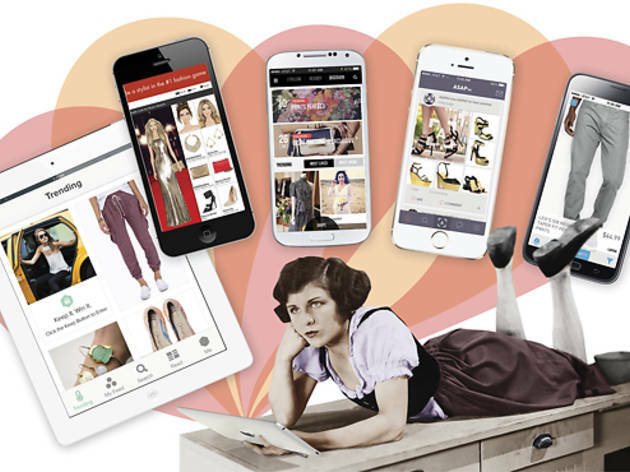 Think of it as Shazam for clothes. Men need shopping apps too. Dapper allows guys to browse and shop based on style (“dressy”) or occasion (“casual dinner”). The more you use the app, the more it gets to know your preferences and habits, which makes future purchases even easier.